On July 29, 2017, the International Buddhist Ethics Committee & Buddhist Tribunal on Human Rights is communicating with the WORLD PEACE PRIZE AWARDING COUNCIL in order to make an International Repudiation to the World Peace Prize given to Dr. Bhaddanta Kumarabhivamsa, who is Chairman of the State Sangha Maha Nayaka Committee of Myanmar. 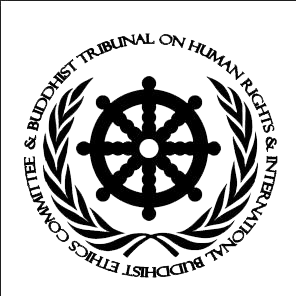 This International Repudiation is due to the fact that the State Sangha Maha Nayaka Committee of Myanmar was sentenced for the serious crimes of FALSE BUDDHISM and VIOLATION OF THE BUDDHIST LEGAL CODE, OPPRESSION AND ILLEGAL DETENTIONS AGAINST BUDDHIST SANGHA, COMPLICITY WITH DISCRIMINATION, VIOLATION OF RIGHTS OF WOMEN AND CHILDREN, VIOLATION OF FREEDOM OF EXPRESSION, VIOLATION OF THE RIGHTS OF THE INDIGENOUS AND TRIBAL PEOPLES, CRIMES AGAINST HUMANITY AND PEACE, COMPLICITY WITH GENOCIDE AND ETHNIC CLEANSING. Therefore, it is formally requested that within the next 7 days Dr. Rev. Han Min Su of the WORLD PEACE PRIZE AWARDING COUNCIL urgently annuls the Peace Prize given to Dr. Bhaddanta Kumarabhivamsa, who has been found Responsible for Crimes against Humanity and Complicity with Genocide, the highest crimes against peace existing in International Law. In case the WORLD PEACE PRIZE AWARDING COUNCIL decides to ignore this formal Act by the Buddhist Tribunal on Human Rights, this will be considered as an act of Complicity with the crimes against peace committed by Dr. Bhaddanta Kumarabhivamsa, and it will be duly sanctioned by Buddhist Law.